Over a period of time, carbonation will affect concrete cover to reinforcing steel and lead to its corrosion. Unattended this will in time make the structure unsafe and eventually uninhabitable. This effect is especially associated with the construction where there is an insufficient concrete cover to reinforcing steel. 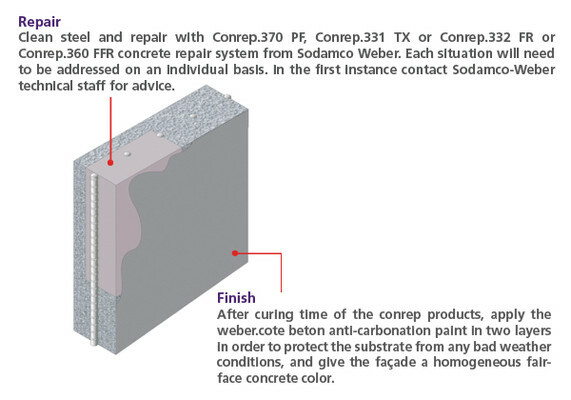 Simple cutting out and repair of decayed areas can leave uneven surfaces, and even after fairing coats are used, buildings retain their original, often dated, appearance. Even when repaired, the process of deterioration will continue in other areas if no action is taken to protect the structure from the elements. Old structures that have degraded over time often have low levels of thermal insulation when compared to modern standards and are more likely to suffer from related condensation and damp problems. Assess and cut out areas of damaged reinforced concrete. Assess structural strength and stability.